Teachers around the country were watching closely as their Los Angeles counterparts took to the streets, and now teachers throughout Virginia plan to march on their capital Monday and Denver educators are poised to strike next. In California, teachers in Oakland are voting next week on whether to authorize a strike. And in the capital, Sacramento, union members are clamoring for their own strike vote. Los Angeles educators, who ended their strike Wednesday, wanted more funding for public schools, higher salaries, more support staff, and smaller class sizes. Virginia educators, who are making their demands at the state level, have similar concerns; they plan to lobby for increases to education funding and higher teacher salaries, plus other measures to improve conditions for teachers and students. The demands in Los Angeles and Virginia echo those of teachers in red states who walked off the job last year in the first wave of #RedForEd teacher demonstrations. But Denver is a different story. There, the union wants to reduce incentives that teachers in the district can earn for working in hard-to-fill positions, being part of high-performing schools, teaching in high-poverty schools, or taking professional development courses. Instead, the union wants higher base salaries for all teachers. The Denver teachers voted overwhelmingly to approve a strike during sessions Saturday and Tuesday after talks broke down between district and union leaders over ProComp, Denver’s compensation system for teachers. The union and the district announced late Thursday they will continue to negotiate until the state intervenes, which could postpone a strike for as long as 24 days. If the governor decides to get involved, he could delay a strike for up to 180 days. The two sides missed a deadline last Friday to renegotiate the system, which involves a complex system of bonuses. The union argues that the system is too complex, making it difficult for teachers to predict their income from year to year. The district’s proposal simplifies the framework to some extent, but district officials say the incentives are necessary to recruit and retain teachers, especially in high-poverty schools. The district says its latest offer could make Denver teachers among the highest paid in the region and removes salary caps while keeping incentives for teachers in hard-to-fill positions. Developed through a collaboration between the union and the district, ProComp has been in place since 2005 when voters approved a tax to fund incentives for teachers. Even then, there were concerns that the system was too complex. The two sides are about $8 million apart in their latest offers, and they’ve been negotiating for about 14 months. This dispute is separate from routine contract negotiations; the union and the district agreed to a master contract in 2017. Because the funding for ProComp comes from a designated revenue stream approved by taxpayers, the money cannot be used for anything else. 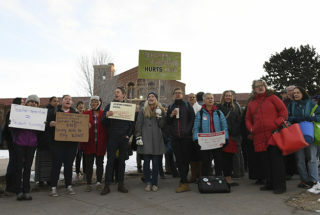 Rolling back ProComp too far could result in a legal challenge and the district having to return the money to residents, said Paul Teske, dean of the School of Public Affairs at the University of Colorado Denver. “In terms of ProComp, it seems to me they need to thread the needle, where they keep the incentives that keep the ProComp money flowing in from the taxpayers” but reduce the amounts of the incentives to satisfy the union, said Teske, who has evaluated ProComp and co-written a book about the system. Even factoring in the incentives as they exist now, Denver teachers have a valid argument that their pay is lagging, Teske said. “It’s legitimately true that teacher pay is low in Colorado, including in Denver,” he said. The district has said schools will remain open if teachers walk off the job, staffed with highly paid substitutes. In recent days, officials have been recruiting furloughed federal employees to work as substitutes. Denver Public Schools include about 5,300 educators and 71,000 students. Teacher pay is a key factor in Oakland, where negotiations between the union and the district echo those in Los Angeles. Oakland’s teachers union is demanding a higher pay raise than the district has offered as well as smaller class sizes and more counselors and nurses. Teachers, students, and community members confronted the school board about looming budget cuts and possible school closures during an intense meeting Wednesday, and teachers have staged two sickouts in recent months to draw attention to their demands. Members will vote starting Tuesday on whether to authorize a strike if contract talks break down, with the voting going from Jan. 29 to Feb. 1, the East Bay Times reported. The most recent contract there expired in July 2017. Sacramento, California, may also be on the path to a strike. A union official from Sacramento told NBC News this week that his members were asking for a strike vote, saying the district isn’t meeting its commitments on class size. The Virginia Education Association and a grassroots group called Virginia Educators United are organizing teachers throughout the state to attend a march, rally, and lobby day at the state capitol Monday to demand more education funding from state lawmakers. One Virginia Educators United organizer told The 74 the group is not ruling out a future strike if lawmakers do not meet their demands. Some schools are off Monday for professional development days, so the impact on classrooms could be limited. *This article was updated to reflect that state intervention in Denver postponed a possible strike.